As the Spokane Police Department releases another wave of body cameras to patrol officers, a new report released this month tells how the 25 officers who participated in the department's body camera pilot program feel about the new technology. The pilot program lasted from Sept. 1, 2014 until Dec. 31, 2014, and the report documents officers' and citizens' reactions to cameras during that time only. Most of the 25 officers felt body cameras were a good tool that may have contributed to de-escalation of some situations, though there were some concerns (detailed below). Since the pilot program ended, SPD has been rolling out cameras periodically. Ninety officers got cameras in June of this year, and by Dec. 4th, 154 of the 220 originally purchased cameras will be in use. By the first of the year, 200 cameras will be issued to patrol officers. Sgt. David Staben, who conducted the audit of the pilot program, identified several key findings, but highlighted two big issues with SPD's body camera program in a subsequent conversation with the Inlander. The first is supervision. Currently, the department doesn't have anyone in a supervisor's role (such as a lieutenant) overseeing the correct use of cameras and storage of footage. Instead, one line-level officer manages the entire thing. That's a problem because if an officer forgets to label his or her video after uploading it to the storage system (which happens occasionally, Staben found), as the policy says to do, the line-level officer has no authority. But the first issue is nullified by the second. SPD is still operating under its "draft policy," meaning officers won't face any discipline for violating it. "The officers don't know how ultimately body camera footage is going to be used in discipline," Staben says. "The city needs to negotiate with the [Spokane Police] Guild about how we're going to deal with footage from body cameras and firm up the policy around it." — 92 percent of officers had an overall positive opinion of body cameras, 80 percent believed the cameras will reduce citizen complaints and 72 percent expressed privacy concerns for citizens. — Training was one of the most prevalent concerns for officers. Before the pilot program, Staben says, officers were given very little guidance on questions like: "Should I record if I'm in a hospital?" "Should I turn the camera off if a citizen requests I do so?" The ACLU of Washington had similar concerns. — Most officers said there was some difficulty remembering to turn the camera on. One suggestion, according to the report, was to incorporate "repetitive training" to make activating the camera more instinctive. — Some officers felt the camera had a de-escalating effect on their interactions with the public, meaning citizens were more cooperative knowing they were being recorded. — A majority (52 percent) of the officers said they reviewed the footage "sometimes" before writing a report. Twenty-eight percent said they viewed it all the time, 8 percent said they didn't review the footage first and 12 percent said "most of the time." 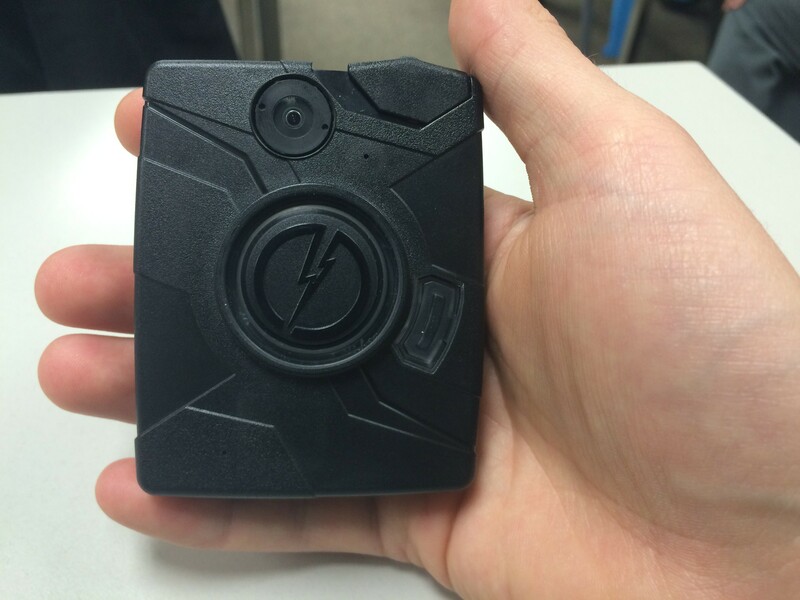 — Two of the 25 officers were not in favor of body cameras, saying the policy needed to be clarified. — 86 percent believe body cameras will improve policing, and 85 percent believe they will improve police behavior, but only 73 percent believe they will improve the behavior of suspects. What does SPD's current "draft policy" say? — Patrol officers shall record interactions with citizens where the interaction will create an incident number. — The policy tells officers to use discretion for when to turn cameras on, but doesn't offer much further direction beyond asking a supervisor. According to Washington's Privacy Act, officers do not have to turn cameras off at the request of a citizen because such interactions are not considered private. — Officers shall notify people that they're being recorded. — Officers may view their own video footage at any time. — Officers may also view footage of themselves taken by another officer of a use of force incident before making a statement to an internal affairs investigator. Did the cameras impact use of force? 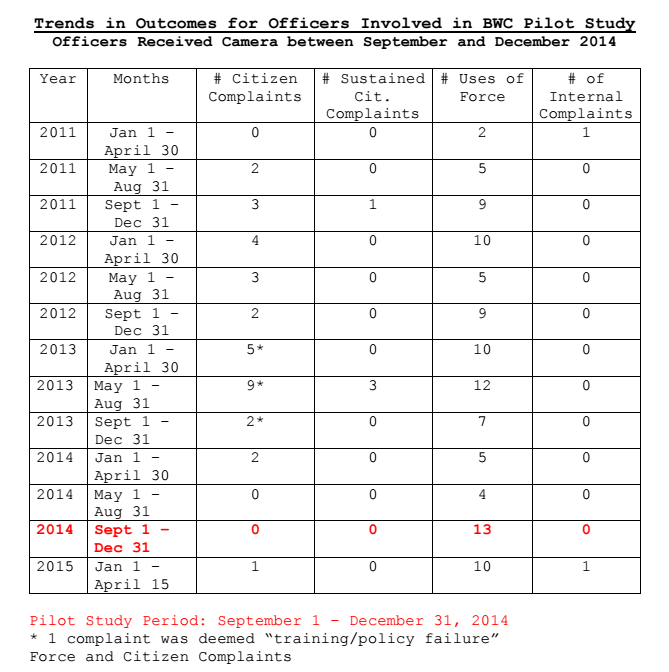 Officers who participated in the pilot program were involved in 13 use of force incidents, more than any other four-month span dating back to 2011 (see chart below). However, the relatively short timeframe did not allow Staben to draw any conclusions about the relationship between body cameras and uses of force. How have body cameras been received elsewhere? U.S. Customs and Border Protection, the largest law enforcement agency in the country, should not be required to wear body cameras, according to an internal review by officials within the agency. After a year of field testing, officials determined the cameras "were not designed to meet the rigor required by CBP officers and agents." The Seattle Police Department, which received $600,000 in federal funds to help pay for their body camera program, has started posting over-redacted videos on YouTube. The effort is in part a response to one man's request for ALL of the department's video footage (dashboard and body camera) — more than 360 terabytes of data and 1.6 million individual recordings. After a year with body cameras in San Diego, citizen complaints are down, but officers are using more force, according to a report. The ACLU of San Diego criticized the department for a lack of transparency despite releasing those details. SDPD Chief Shelley Zimmerman has refused to release any body camera footage despite state law and department policy that allows her to do so, the ACLU says. — The battery: lasts about seven hours, which isn't an entire shift. — Buffering: the cameras are constantly buffering, so when an officer hits record, the camera saves footage from 30 seconds before. — To record: officers must hit the center button twice.